Hailing from the Land Down Under, Rebekah has been living in the Comox Valley since mid-2014. Rebekah is a free spirit…literally. 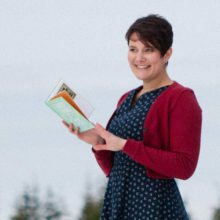 Rather than being blown by the wind, Rebekah is led by the Spirit and goes where it leads her – in this case, it was Vancouver Island and the Comox Valley in particular. She works a couple of days a week in the gorgeous life-style store, Rusty Rooster, in downtown Cumberland and spends the rest of her time moving around the Valley with her housesitting and pet-care services; ministering to people; loves journaling and reading, especially in local cafes; wandering the many trails on the island, swimming in the variety of different water spots; with animals, and being immersed in nature.